The dumbbell bench press is a bench press variation that can be done to boost overall strength, enhance muscle hypertrophy, and isolate areas of weakness in the bench pressing movement for most strength, power, and fitness athletes. The dumbbell press falls within the horizontal pressing domain, which also includes: barbell bench press, push ups, and angular variations (decline, incline, etc). Regardless of the variation, bench pressing can be used by coaches and athletes to enhance overall muscular strength and hypertrophy, but also to improve bench press and overall pressing performance. Below is a step-by-step guide on how to properly set up and perform the dumbbell bench press. Step 1: Start by lying supine on a bench (face up) with a dumbbell tightly grasped in each hand. The bench itself can be flat, on an incline, or decline. Be sure to set the hips and upper back/shoulders on the bench to create maximal stability and tension to support the press. Step 2: With the back and hips engaged, squeeze the dumbbell handle and pull the weights down to the sides of the chest, keeping the shoulders away from the ears and the elbows slightly tucked inwards towards the body (about a 45 degree angle at the shoulder joint). The elbows should be directly underneath the wrist, as this will help keep the shoulder joint in proper positioning and allow for maximal back tension. Step 3: At the bottom of the press, the weights should be slightly outside the torso, with the shoulder blades retracted and depressed (down towards the hips) to help maintain upper back stability. This will help keep the shoulder joint from being placed in a detrimental position as well. Step 4: When ready, press the dumbbells back to the returning position without letting the elbows flare out directly to the sides. Think about pressing yourself deeper into the bench and/or pushing yourself away from the dumbbells. Below are five huge reasons why powerlifting, strongman, Olympic weightlifting, and yes, CrossFit athletes should be doing the dumbbell bench press. While the bench press is often seen as a “bro-sesh” kind of movement, it can truly develop the upper body strength and muscle mass needed for most strength, power, and fitness sports. Bench pressing in general can create some serious strength and hypertrophy gains. No matter the sport, nearly every lifter could benefit from increases strength and muscle mass. The bench press, as well as the overhead movements are critical for upper body pushing strength development. By only training overhead pressing movements, you negate a vital movement patterning of the human body, not striking balance with increase pulling and other movement volume. Additionally, many lifters enjoy bench pressing, therefore by allowing a lifter to bench press can increase motivation to train which can lead to long term commitment to increases in upper body strength, front rack positioning, and overall muscle mass. Unlike the barbell bench press (and other fixed pressing movements), the dumbbell allows a lifter to rotate their arms, position their shoulders, and change the movement patterning slightly to better suit their joint integrity needs. Some lifters may get shoulder/elbow/wrist pain from pressing with a barbell (while others don’t). Rather than for a lifter to either (a) lift very light so that there is not pain (3) train with regular loading and risk further injury and/or discomfort in pressing movements. Dumbbells can be used to attain all of the above goals, while still allowing for serious loafing on muscles, connective tissues, and joints. In an earlier article I discussed in depth the importance of unilateral training, for all segments of the body. By performing dumbbell bench presses, you can reap all normal benefits of bench pressing AND al the unique benefits of unilateral training. 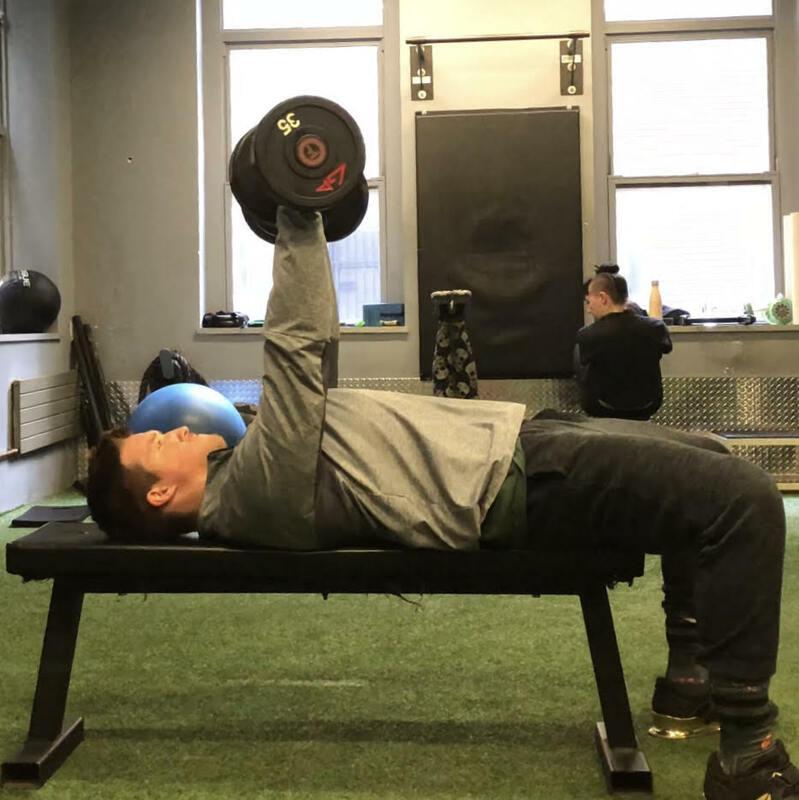 Unlike the barbell bench press, the dumbbell bench press allows for increased lengthening of the muscle fibers and even joint capsule while pressing. For some lifters, failure to increase personal records or getting stuck in the bench press could suggest poor end range control and/or lack of overall development of muscle fibers. By increasing the range of motion and the ability to promote force throughout, you also increase your shoulders and chest muscles injury resilience, which is often lacking in competitive sports (especially during explosive or high volume movements). Additionally, by increasing the amount of force that you can produce at end ranges of movement you can increase maximal strength and power at off the chest in the bench press, often a sticking point for many. Due to the dumbbells being independent of one another (unlike the barbell bench press), the body must work to properly stabilize the load unilaterally, meaning that any compensation patterns covered by a lifter being able to shift greater load and control to a stronger/healthier arm is minimized. The payoff is that the lifter can then strengthen and challenge joint stabilization and train dormant muscle groups to increase control and firing rates, which can then be applied into competitive bench pressing or other fitness exercises. The pectoral muscles (chest) are the primary muscle groups involved in the force production needed to perform the dumbbell bench press. With dumbbells, some lifters may find that they can go into deeper ranges of motion during the eccentric aspect of the lift, fighting the demands placed upon the chest muscles. Additionally, the unilateral demands of dumbbell bench pressing has also been shown to increase muscle activation of the chest and pressing muscles. The triceps are involved in the stability of the elbow and responsible for the final extension of the elbow to lock out the bench press. Depending on the angle of the upper body and wrist, lifters can manipulate the movement to increase triceps demands as well (close grip dumbbell bench press). Who Should Do Single Arm Dumbbell Bench Presses? The single arm dumbbell bench press can be highly beneficial for all strength, power, and fitness athlete. The below groups can benefit from learning and performing this movement due to the various reasons listed below. The dumbbell bench press can be integrated into strength and power athlete programs to increase upper body strength and muscle mass of the chest, triceps, and anterior pressing muscles. Below, we will discuss how to integrate the dumbbell bench press in to training programs. The dumbbell bench press is a movement that offers fitness goers a wide array of muscle and strength building benefits. In the below sections, we discuss those benefits and go over the dumbbell bench press variations that all can be integrated into your current training program. In the below section we discuss how coaches and athletes can integrate the dumbbell bench press into current training programs. The dumbbell bench press can be done as a main strength lift for the day, similar to that of the barbell bench press. Some lifters however, may not have heavy enough dumbbells to train for maximal strength. If this is the case, a barbell is often used to stress maximal strength with dumbbells being used in more strength/hypertrophy training blocks (see below). The dumbbell bench press can be added into accessory training blocks to increase muscle hypertrophy, reinforce proper pressing mechanics, and enhance muscular development of the upper body. Refer to the below section for sets, reps, and weight recommendations. Below are three primary training goals and programming recommendations when utilizing the dumbbell bench press into specific programs. Note, that these are general guidelines, and by no means should be used as the only way to program dumbbell bench press. For strength building sets, athletes can perform lower repetition ranges for more sets. Muscle hypertrophy can be accomplished by adding training volume (more reps), time under tension, and/or training towards fatigue. Some lifters may want to train greater muscle endurance (for sport), in which higher repetition ranges and/or shorter rest periods are recommended. Below are three (3) dumbbell bench press variations that can be used by coaches and athletes to keep training varied and progressive. The dumbbell floor press is a dumbbell bench press variation that is done by lying on the floor rather than a bench. In doing this, you restrict the overall range of motion in the pressing movement, increasing the demands on the triceps to assist in the lockout position. In addition, it can help individuals establish a deeper understanding of how to stabilize the upper back during the movement. The dumbbell reciprocating bench press is a unilateral dumbbell bench press variation that has the lifter move one dumbbell at a time, alternating between the left and right sides pressing. This can be done to increase complexity of a press, increase rotational resistance, and help to increase the overall functionality of the lift for individuals who may be involved in more contact-based sports/events. The single arm dumbbell bench press is done by using only one dumbbell (rather than two dumbbells) during the bench press movement. 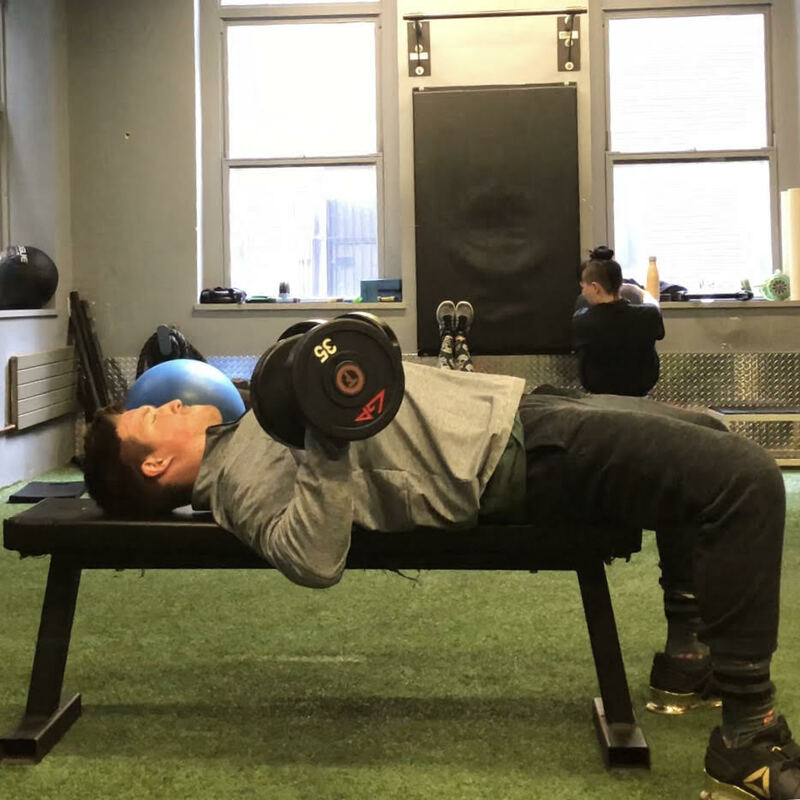 This variation offers athletes and coaches unilateral stability, strength, and can enhance core and glute activation in the bench press movement. 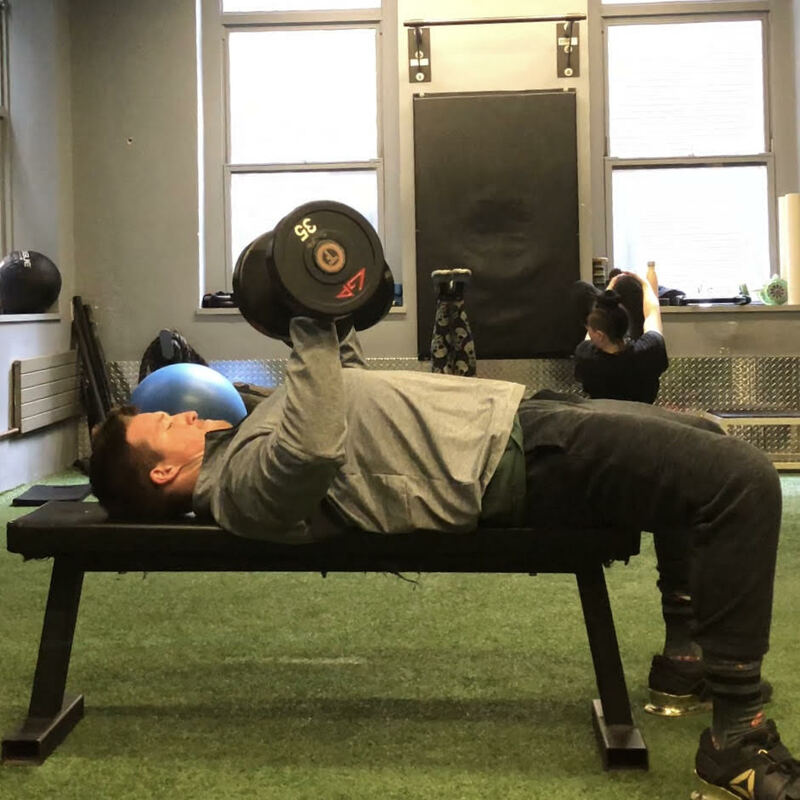 Below are three (3) dumbbell bench press alternatives coaches and athletes can use to increase chest and triceps strength and muscle hypertrophy. The overhead press is a movement that targets the shoulders, triceps, and upper chest, and can have a significant impact on total body strength. Lifters who are looking to increase bench press strength and upper body mass can build in overhead pressing to diversify their pressing strength and better balance out upper body training programs. The barbell bench press can be done to increase sport specific strength (powerlifting) and is often used to increase overall strength and muscle mass. Unlike the dumbbells, the load is not independently managed, making it easier to use heavy loads and attack maximal strength in the pressing movement. Check out this article where we go over the differences between the barbell and dumbbell bench press and determine which one is best for you. The axle/fat bar bench press can be done to add variety to the bench press training and to reinforce proper position in the press. I find that the axle bar bench press can enhance wrist stability and help lifters establish better elbow positioning in the bottom position of the press (due to the necessity to actually pull the weight into the body and squeeze the fatter bar).